Hello! Once I started using the Shu Uemura Silk Supreme Crystalizer I can never go back to the normal cotton pad anymore, I’m so spoilt (evil smile). But it is true, I can see and feel the differences every time I apply my TSUYA Skin Lotion with the Silk Supreme Crystalizer. By the way, do you know that Cosmetic Water is one of the most important elements for the perfect makeup finish. What is Cosmetic Water? How to synergies skincare and makeup? I deeply believe in Shu Uemura founder’s philosophy “beautiful make-up starts with beautiful skin,”. Is so true… skincare come first then only makeup, but both are important in women’s beauty life. With a beautiful, healthy skin canvas, we have more freedom and flexibility for unlimited makeup expression, and can maximize each woman’s “individual beauty.” by uchiide, International artistic director. Basically, skin prep and makeup base are very important to ensure that our makeup stays longer, look radiant and surprisingly it will also help to enhance the colors. So good skincare is very important and potent to our skin especially to those like me who apply makeup almost every day; our skin tends to deprived from oxygen. I choose my skincare very carefully and I usually use anti-aging, hydrating and brightening series. Started with TSUYA Skin Lotion with Silk Supreme Crystalizer, Essence (skin youthful radiance generator), Eye Concentrate. The TSUYA Emulsion and Cream will be available soon. Alright TSUYA came in just in time when my skin needed more care and I need to look good in camera plus in my selfie. Oh yes, selfie is very important we usually take a close shot the all the lines, tiredness, dry and dull skin will say hello too if I do not use the right skincare and makeup. 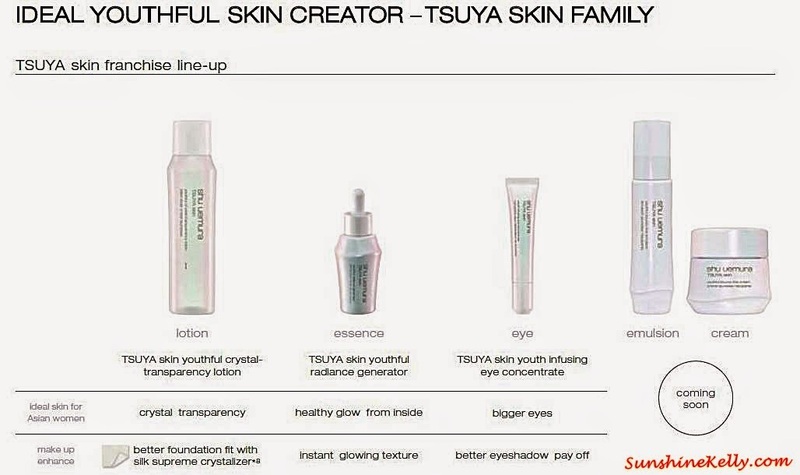 Well the new TSUYA skin lotion (youthful crystal - transparency lotion) is ideal and synergies make-up artistry and scientific innovation to help boost skin’s self-cleaning mechanism and draw out crystal clear skin from within. Wow! It answers to my needs, how about yours? Starting with cleansing oil for purification, shu uemura skincare enhances the skin canvas through tangible results and perfect affinity with both skin and makeup. The difference with (left) and without (right) TSUYA Skin Lotion & Silk Supreme Crystalizer. Skin looks smoother, brighter and more refine when using the skin lotion with the silk lotion pad. One new thing I learned from Shu Uemura “Cosmetic Water” is one of the most important elements for the quality of each individual skin canvas, aiming to bring a fresh, water-filled touch to skin and a pure, transparent look to skin for a perfect makeup finish. TSUYA Skin Lotion also known as Cosmetic Water aids in the creation of the ideal skin texture, supple with a petal-soft, dewy touch, and an ideal look, with boosted transparency and healthy glow. I was in Japan last month, oh my I tell most of Japanese women and men skin are almost perfectly flawless and they look way much younger then their actual age. I think I should request my company to send me to work there longer, I love Japan. The TSUYA Skin Lotion is available in 3 formulas to cover all skincare needs. Discover the secret of ideal youthful skin and create the perfect skin canvas for beautiful make-up. It helps to refresh, nourish and brighten the skin. I am using the Shu Uemura TSUYA Skin Lotion II, suitable for Asian dry and dehydrated skin. III is more for those in cold country or best use during winter. The number I is for oily and acne prone skin user. Is a must for me to apply my TSUYA Skin Lotion II (Cosmetic Water) with the Shu Uemura Silk Supreme Crystalizer. The combination of both gives the best result and skin prep for makeup. My skin feels fresh, hydrated and brighter; plus I also notice my skin is plump thus reducing the fine and dry lines. Leaves skin soft and smooth as a petal; dullness and yellowness appear significantly reduced to reveal crystal-transparency from deep within. Next I am ready for my makeup. This is an innovative dual sided lotion pad provides extraordinary smoothness while delivering moisture and suppleness to skin for the better foundation fit. 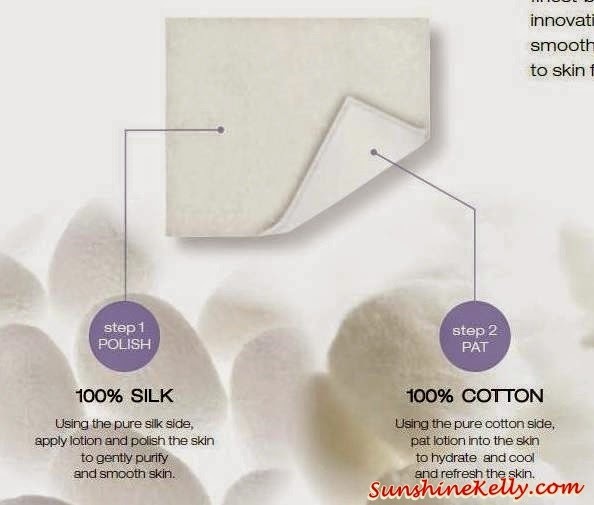 Use the 100% Pure Silk side to apply the TSUYA Skin Lotion and polish the skin. It gently purify, remove the residues and smoothen our skin. As you can see some of the dirt or remaining residues are removed. Use the cotton side to gently pat the TSUYA Skin Lotion to hydrate and refresh the skin. Overall, if you want to achieve the dewy youthful skin and makeup last longer, the TSUYA Skin Lotion is the answer. It’s a Cosmetic Water that synergize skincare and makeup.